Eisspeedway Journal: BEWLEY AND GARRITY COMPLETE CARDIFF LINE-UP! Dan Bewley and Jason Garrity named as Adrian Flux British FIM Speedway Grand Prix track reserves. British Championship finalists Dan Bewley and Jason Garrity complete the Adrian Flux British FIM Speedway Grand Prix line-up after being named as track reserves for the Cardiff event on July 21. Bewley, who wears No.17, finished second to champion and Cardiff wild card Robert Lambert following an epic final showdown in Manchester on June 11. 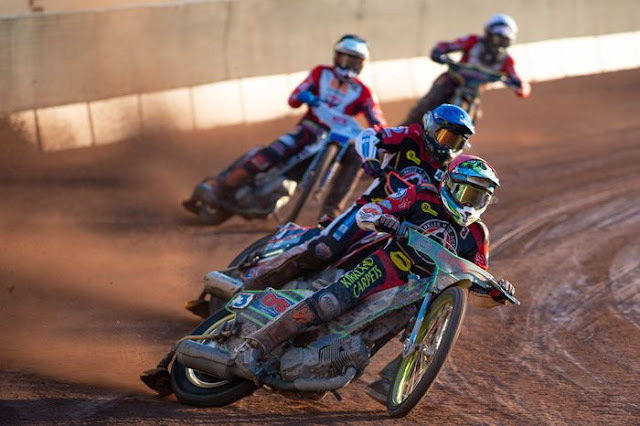 The FIM Speedway Under-21 World Championship qualifier has starred for Belle Vue in the SGB Premiership and SGB Championship club Workington. His British efforts saw Polish club Rybnik sign him up and the 19-year-old is already piling up the points in the First Division. Garrity returns to Cardiff as No.18 after serving as a track reserve at the Principality Stadium in 2015. He battled his way to fourth place at the British Final – a performance which helped him earn him a contract with Belle Vue. The former British Under-19 champion also doubles up with Scunthorpe in the Championship. Bewley and Garrity will take to the track in the event of one of the 16 starting riders being ruled of a race due to injury, illness, a starting offence or other reasons. The referee at the Principality Stadium will be Christian Froschauer of Germany.